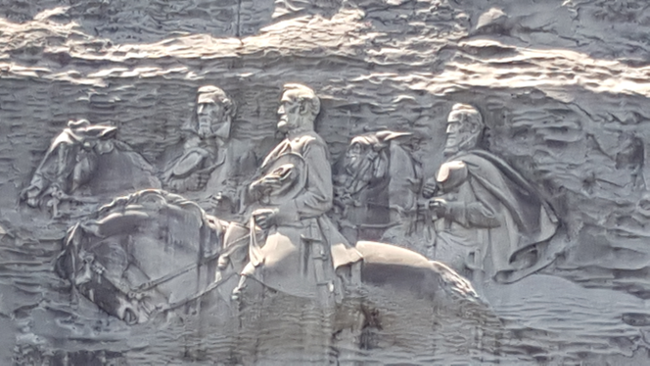 The sculpture at Stone Mountain, Georgia, depicts three heroes of the Confederacy: Robert E. Lee, of course, Stonewall Jackson, and Jefferson Davis, the CSA’s first and only president. Every Southerner knows who these people are, and every Northerner ought to know who they are — they were greatly respected by their peers in the Union, if also hated and feared. I was saddened to learn that the finished result here contains none of the sculpture that Gutzon Borglum (of Mt. Rushmore fame) began back in 1914. He carved only one face (Robert E. Lee’s) before the project was taken out of his hands. According to the little film they show in the auditorium here, the people who completed the sculpture removed that face of Lee that Gutzon Borglum had finished, as part of the process of creating this existing sculpture. It was so hot and humid here at Stone Mountain I wondered what the melting temperature of granite was (per Google, that’s 2300 degrees Fahrenheit) — okay, so it wasn’t quite that hot, but still, enough to make one wonder whether this sculpture will ever melt in the heat.